JEE Main 2018 pen & paper based exam is going to be held on 8 April 2018 and the computer-based exam will be conducted on 15 and 16 April 2018. It is one of the most important entrance exams for the student who wants to make a career in engineering. Paper 1 can be taken in either the CBT or PBT mode but Paper 2 can only be taken in Paper-Based Mode. The student should keep the following points in mind before appearing in JEE Main 2018 Exam. These are the simple yet effective ways to crack the entrance exam. Get Sound Sleep the night before the exam: You may feel some uneasiness in the night before the JEE Main exam but it is where you have to show your calmness and take at least 8 hours sound sleep this night. Avoid cramming and throw out that idea of revising salt analysis this night. Get to class a little early: You are supposed to be there half an hour before time according to instructions, so keep this in mind before setting your alarm. You can also pick your favourite seat where you can feel comfortable (if seats not allotted according to the roll number). You will surely feel relaxed during paper if you have already spent half an hour staring those walls and instructor. Never Forget this thing: Water Bottle: (Must) You will need water while taking this paper, It can for sure serve as a pulling hand for you if you are stuck somewhere and feel the need to move on. Drink it after completion of every section. You will feel confident and calm after drinking it in the exam. Your efficiency will increase for sure. Read those instructions- they are the saviour: That’s one of the advice you knew already and hearing those same words seems illegitimate. No, generally JEE plays with the mind of students and always there is a change in some instruction about which no one can guess. So don’t try to guess the change or trick and SINCERELY read those words on the first page bit by bit. No Assumptions: You have taken many tests of your institute and test series and have read those instructions many times. Your mind also knows the rules are obvious. WAIT KID! Here nothing is obvious or known to you before the exam. Every single rule must be written on Instructions page and you are not supposed to assume anything by yourself considering it obvious. The words on instructions page are god rules and if they are not mentioning that multiple answer question will be correct only if all correct options are ticked and no wrong answers are ticked. Then there can be a probability of partial marking, Remember they must have mentioned it some or other way very specifically. Just read it. It happened in Past. So don’t assume anything by your own if not given. Come with a Game Plan in your Pocket: Your marks here depends on many things and the time management you will show here will be counted and reflected in your total. So make sure to have an efficient time management plan which suits your mind and decide which section you will do first and others order too. Make a minimum and maximum limit of time you will be giving in every section. Have reserved time for OMR filling. Decide whether you will fill OMR in last or simultaneously with solving questions. These things must be analyzed and must be decided outside the class before coming. You must know answers to all these questions before entering the classroom. Handle your Nerves: I’m not going to say that this is just a test or some typical lines you hate. 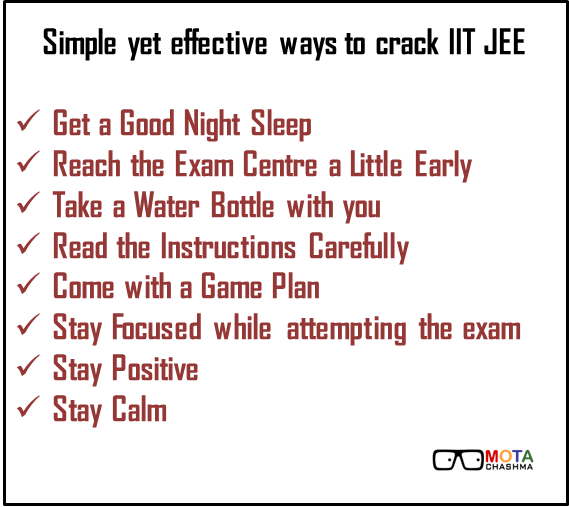 JEE is a very important test and you have to show your true character here and give your best. To give your best you must not be nervous here. That’s where half of your competitors fail. Trust me, half of the students taking JEE Main knows that they are not going to crack it and they don’t. JEE is a test of mind. The subjects are not just Physics, Chemistry and Mathematics. It also includes Patience (You need steel nerves here), Time Management, Smartness, Sincerity, and many things which makes a brilliant mind out of the league. Act like you are the only person in the classroom: Avoid looking at others and trying to make friends here. They are just some strangers who have nothing to do with you. Don’t see how fast they are solving the questions or other rubbish things. Feel like you are alone here and make a bubble of your own where you are giving doing something very important. Don’t react or stare at some waste kind of argument your instructor is having with some other kid. You are here to solve a paper in 3 hours and just do that with plugs in your ear. Don't Discuss the Paper in the Interval: You will meet people like they have solved correctly questions for 200 marks out of 210. If they did that they will surely be going to get that rank 1. And only one will get that rank and you already knew many deserving contenders for that rank.So just make some distance from such people and never try to analyze your paper in that two hour time. Just relax and have some light lunch there in the canteen. You have to give another paper of three hours (if you are appearing for Paper 2) so, Relax dude. You don’t need any luck for this exam so let’s skip this wishing formality. He is an IITian who has done B.Tech from IIT Guwahati. Sanju cracked IIT JEE in 2012.